Free NCERT Books download for Class 12 Chemistry Chapter 6 - General Principles and Processes of Isolation of Elements on Vedantu.com. Students can also download the NCERT Textbooks Solutions in PDF for Class 6 to 12 all subjects. Register for Chemistry tuition to clear your doubts and score more in your exams. Question: How to download Class 12 Chemistry Chapter 6 NCERT Book for CBSE? Answer: Students can download it from epathshala.nic.in. 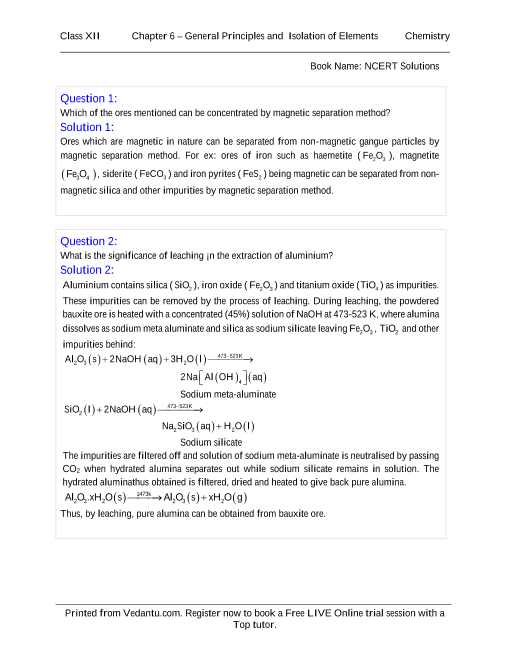 On this page, Students can download Class 12 Chemistry Chapter-6 PDF Solutions of the Book.